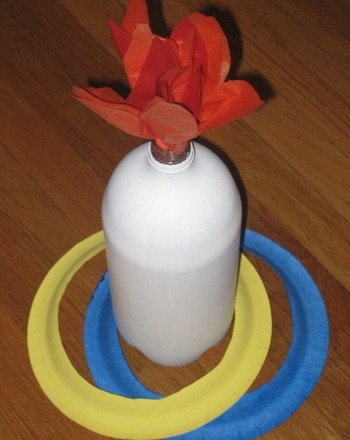 This version of the classic carnival game uses a soda bottle “torch” around which players attempt to sling paper plate Olympic rings. Spread newspaper or a grocery bag over your work surface. Have your child paint the soda bottle white. Apply two coats. Cut rings out of each of the paper plates and paint them the colors of the Olympic rings. If you are using plates that have a slippery, waxy surface on one side, use the other side so the paint can stick. Once everything is dry, you are ready to play ring toss! You can either play with the rule that the person who throws the most rings over the neck of the bottle wins, or you can assign different point values to the rings based on their colour. In the latter case, the person who accrues the most points after tossing all five rings wins. This is like Pin the Tail on the Donkey except, in this case, players are blindfolded and try to tape a paper medal onto a life-sized cutout of a person’s head and torso. Draw the outline of a person’s head and upper torso on a large piece of paper. Cut it out and decorate it any way you like. Perhaps embellish it with one country's symbols such as a maple leaf, for Canada, or the colors of the country's flag. Tape the “Olympian” onto a wall, making sure the cut out is low enough for your shortest player to reach. Draw and cut out a bunch of circles, or medals, and stick a piece of double-sided tape to the back of them. Line up your players in single file. One at a time, blindfold them with a bandana, spin them around several times, and then have them pin the medal as close to around the neck as possible. The player who pins the medal closest to the Olympian wins! 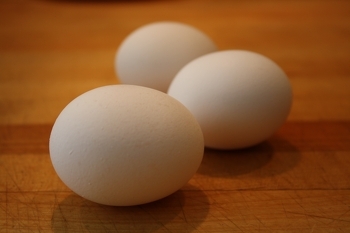 This version of the Egg Relay uses ice cubes instead of eggs. The object of the classic game is to see who can carry an ice cube on a spoon to the finish line the fastest without letting it drop. Have players spread out and line up side by side. Hand each player a spoon and an ice cube. Have them race with the ice cube on the spoon. If a lot of people are playing, then form a relay and have the first person run part of the distance then have the second person take the spoon from him and so on, until everyone has had a turn running with the spoon. If the person drops the ice cube, then he can pick it up, put it back onto the spoon and continue. The person who reaches the finish line the fastest with the ice cube on the spoon wins. The object of this game is to see which team can pass a balloon, between their knees the fastest without letting the balloon drop. Alternatively, players can hold balloons under their chins and try to pass them from chin to chin. Form at least two teams with the same amount of players. Each team’s players line up in single file. The person at the front of each line puts a balloon between his knees and turns around and passes the balloon to the player behind him. The second person takes the balloon between his knees, turns around and passes it to the third person, and so on. Players cannot use their hands and the balloon may never touch the ground, otherwise that team must start over. If you don’t have white balloons, large Styrofoam balls can be substituted. The winning team is the first to pass the balloon to the very last person in the line. If it is a short line, have everyone do two or three rounds. The object of the game is to see which team can catch the ice cube in a cup while standing the farthest distance apart from each other. Players pair off in two rows and face each other, standing just three feet away from each other. To begin, players in one row (A) toss the ice cube from their cups and try to get them to land inside the other rows’ cups (B). If they succeed, then they take one step backward while the teammate who caught the ice cube stays where he is. Then each player in the second row (B) slings the ice cube from the cup, aiming for the other player’s cup (A). If the ice cube is caught, then the player from the second row (B) takes a step backwards. Play continues with each side taking turns slinging and catching the ice cube. Eventually, the players move further and further apart and the ice cube begins to melt, so catching it gets trickier. If the ice cube falls, the players have to start over from the beginning. The duo that catches the ice cube while standing the farthest distance apart wins. 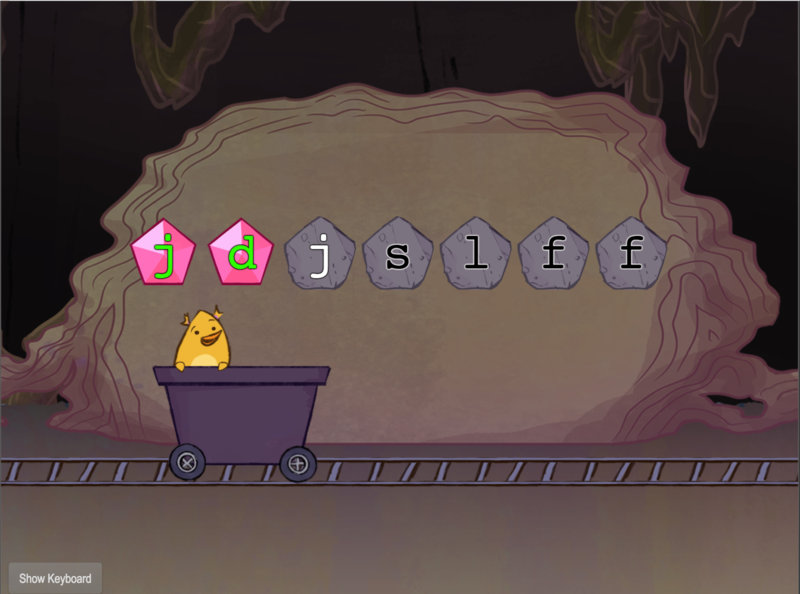 The classic way to play this game is an easier alternative for younger children. Simply use water balloons instead of ice cubes and have children catch the balloons with their bare hands. 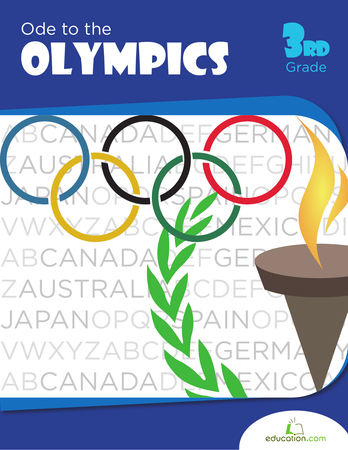 Put your child's maths skills to use with this fun Summer Olympics trip planning activity. It's time to saddle up for the Olympics! Learn more about the equestrian events at the Olympics with this reading worksheet. Your early writer will describe your home and add detail to his writing. We all have our own home of feelings inside, like a shell that we can tuck into when needed. This we learn from turtles, and now your students can too.